The Dogs & Cats in Devin's Novels! Devin's novels abound with colorful critters! She includes the pets of friends, fans, and those who enter the raffles she holds to benefit animal rescue. Scroll down to meet the real-life dogs and cats who inspire her fictional ones. And to learn more about Devin's animal rescue work CLICK HERE. Devin O'Branagan's own Kolbe (on the left) was the inspiration for Talisman the prissy show dog with attitude in the RED HOT series of novels. Jazz (on the right) was the inspiration for Hallelujah the intrepid demon-fighting Australian Shepherd in the GLORY series. Both have passed on now, but they are forever immortalized in Devin's fiction. 2006 Crufts Best In Show - BISS MBIS AKC/ASCA Ch Caitland Isle Take A Chance AX AXJ RS-E JS-E GS-E STDs TDI "Chance" was the first Australian Shepherd to win Best In Show at Crufts, the largest and most prestigious international dog show. His person is Nancy Resetar, and she has given permission for him to make guest appearancea in RED HOT LIBERTY and THE TWILIGHT BONE. He will play himself and will be Talisman's "forbidden love," as two merle Aussies are not allowed to mate. But, whenever possible, they do share stolen moments filled with canine angst! Ross, a Basset Hound from Austin, Texas, will be featured in the upcoming RED HOT LIBERTY. Ross, whose person is Dr. Camille Hemlock, is famous among Basset Hounds for winning many costume contests. In RED HOT LIBERTY he will also wear costumes...all made to resemble an American flag. His fictional person, Liberty True, will begin each day by saying The Pledge of Allegiance to him. Look for her memorable debut in RED HOT LIBERTY! Bocker is a Labradoodle from Athens, New York, who is a model, actor, therapy dog, and reading tutor. His people are Marie Shelto and jazz singer, Steve Shelto. Bocker was in the Steven Spielberg movie War of the Worlds, and Julia Roberts' movie, Eat Pray Love. He will be featured in the third book of the RED HOT series, RED HOT STARS, as himself playing a character in, yes, a Steven Spielberg movie. Art really does imitate life! Maddie, who was part of the Cindy and Brian Coakley pack, was Kolbe O'Branagan's daughter; she was a fearless mountain-climbing wild child. Maddie was the inspiration for a cow dog who is the sister to show dog Talisman in SHOW DOG SINGS THE BLUES, a forthcoming spinoff from the RED HOT series of novels. It is a comic tale told from Talisman's perspective about how she and Maddie are accidentally switched, causing Talisman to have to work on Maddie's ranch for the day. 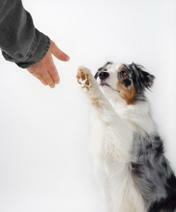 It is an Australian Shepherd Freaky Friday! When I was looking for a model to represent the intrepid demon-fighting Australian Shepherd Hallelujah in The Legend of Glory trilogy, I fell in love with Muse. Besides being appropriately-named to inspire creativity, she is drippingly beautiful. Her person, Shelly Hollen of Houston, Texas, is a professional photographer and so this image of Muse was beyond perfect. Prior to the release of THRESHOLD, I announced a casting call for a black tri Australian Shepherd to represent Wigglebutt, the delightfully happy Aussie character who belongs to young Cole Dillon. So many awesome Aussies were submitted for consideration that the decision was practically impossible. However, I chose RJ. RJ's person is Karen Jones, and his registered name is Int'l Ch. Everlasting's RudeN TudeN Cowboy HSAs, CGC. He actually is a working sheep dog out of Karen's kennel, Everlasting Aussies. Milton Aldridge is a Border Collie with attitude. I really like him and so created the character of Milton in Pretty Sacrifices just for him. In that novel, Milton's family is killed by the demoness, Nyx, and Glory and Dominic adopt him. He comes in handy when all manner of wild animals come to Glory's farm seeking refuge from the demons who have invaded their territory. Milton manages to keep them all in line with his useful Border Collie intensity. A special thanks to Molly Aldridge for allowing me the privilege of including Milton in The Legend of Glory trilogy. To learn about the raffles Devin has held to benefit animal rescue, please click HERE. Listen to Devin being interviewed by internationally famous animal communicator Val Heart on "The Real Dr. Doolittle Show." They discuss all the colorful animal characters in Devin's novels, and how most are based on the pets of friends, fans, and the participants in raffles she conducts to benefit animal rescue! All of Devin's novels are available in both print & eBook formats. Most are available as audio books via Amazon, Audible, & iTunes. Available from your local bookstores and libraries, too! Don't be shy - ask your library to order it for you! Photo of Chance courtesy of Nancy Resetar. Photo by Tom Weigand of The Winning Image. Photo of Ross courtesy of Dr. Camille Hemlock. Photo of Marina Night courtesy of Angie Clark. Photo of Bocker the Labradoodle courtesy of Marie Shelto. Photo of Maddie courtesy of Cindy and Brian Coakley. The photos of all fictional characters are professional model representations.